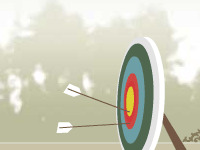 Description: Hit all of the targets before the time runs out in this tricky archery challenge! . Bow Shooting is a Archery Games. Instructions: Mouse key - To aim,set angle and shoot. Left/Right Arrow keys - To look around. .